Our New E-Book to be published Soon!!! The first two or three pages of each story plus the complete technical discussions. Perhaps it is time for the man-machine master-slave relationship to die away. Perhaps it is time for our true symbiotic relationship, we men and machines. But, symbiotes love each other in many special ways that we barely comprehend. Perhaps the right time to explore love again is while traveling down a long and desolate road. The Mars dawn had broken clear and cold. Stretching out before the rover was a rolling plain of rocks and shifting sand under a gray-salmon sky. The shadows stood long, but there was now enough light to see the terrain ahead clearly. Andromeda pushed the rover up to day-speed with the crunch of sand under hollow wheels. "Our track looks solid for the moment," said Cephei, "but there's a patch of loose dust 400 meters out, so veer west to avoid it." In the weak gravity, their worst enemy was the dust. Anything the wheels could grip they could roll over, but fine dust could break their traction and cause them to wallow in. Serving as navigator, Cephei could judge their grip from the way windblown particulates blew around the scattered rocks. Variations in the drift patterns could mark the transcendent ripples of some nameless river, now a billion years dry, or was it merely where the winds had moved the grains the day before. Cephei had at her disposal a series of detailed surface-maps and a coarser LIDAR laser range finding system. The most detailed images came from the cameras aboard the rover itself, and the images with the widest coverage were taken from real Andromeda, a spaceship in low orbit around the planet. The LIDAR images were sketchy but could cut through dark and shadow. Tying the rover and ship together for both images and commanding was a complex data link. Its highest bandwidth came ten minutes at a time during line-of-sight linkages once in every 110 minute orbit. More limited links were also available through satellite jumps, but there were times when the real rover was running on stored commands and the most basic forms of logic in its safety systems. The Mars-Earth signals were too slow to be helpful at all. Most of both Andromeda and Cephei's artificial intelligences remained in the ship as they were much too big for the memory of the rover, which was a rather dumb brute with no virtual persona at all. The mind split between the two physical devices seemed to mother and daughter to be a serious risk. Still they had no choice but to drive a virtual rover over Andromeda's virtual Mars while depending on the complex data link to ensure that the real rover rolling over the real surface of Mars passing far below matched it wheel turn for wheel turn. This was the first human trip to Mars. Artificial Intelligences, like Andromeda and Cephei, had been here before, albeit never such sophisticated ones. This mission was a human mission first and foremost. The AI's were meant to provide safety and support only. This was the humans' big show, not theirs; and they were fine with that. "Watch the supercharger pressure," Ann said, "Burning rocket fuel in an internal combustion engine has almost no heritage. If the supercharger falters even a little, the oxidizer mix will get too rich and burn a clean two centimeter hole through a piston head." "The inter-pressure is good, the revs are good," replied Cephei. The sound of the rover's metal wheels against the ground, which carried up through the rover's metal frame, altered audibly. "We're getting some surface crusting," said Cephei, monitoring their rover's tracks with the rear camera. At the crest of a low ridge the rover slowed momentarily to take a full panorama of their surroundings. A smooth plain stretched out before them. Ahead lay many hours of steady rolling. They watched in silence for some time as the kilometers rolled by and the interlinked silhouette of hills to their west, first purple, turned to the red pervading the sky. 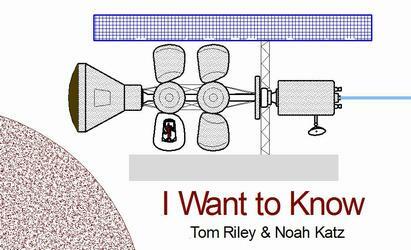 The mission to Mars in this story is kept as closely as possible to Robert Zubrin's "Case for Mars" 1. This mission plan features direct launch of the astronauts from Earth after prepositioning everything they need on Mars. This includes a machine that manufactures fuel for the return trip from Mars's atmosphere and a rover with an enclosed passenger compartment. That said, new information from the LRO mission 2, 3, has come out since Zubrin's book, which suggests that radiation dangers for astronauts in long-duration space flight is about twice as bad as previously thought. This concern is addressed in this story by placing the astronauts in small pods that are shielded with all of their supplies. This is equivalent to keeping them always in the pantry as suggested in the Zubrin mission plan for short-term radiation events. Confining people in such a small space for months would clearly drive them completely mad. This problem is in turn addressed in this story by having People Pods provide both exercise capabilities and a total immersion virtual environment. 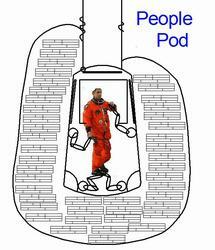 The Pod design used here was worked out in discussions between authors and Sheldon Brown of the Arthur C Clark Institute for Modern Technologies in California. The two main characters in this story, Andromeda and Cephei, are both artificial intelligences. 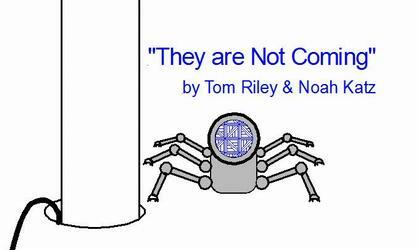 The overall direction of the story is exploring various aspects of a symbiotic relationship between humans and AI's. Ann's physical being is the spacecraft itself, but she has a virtual appearance as a beautiful woman. All the astronauts, along with the AI's, spend most of their time in virtual space, often in strenuous exercise, and Ann joins them there virtually as a full team member. Cephei is Ann's daughter who is not a full team member and is present to learn how to be a useful AI in the future (and to properly become her own spacecraft). At the end of the story, Cephei returns to Earth to become her independent self, a ship on a mission to a near-Earth asteroid. Symbiotes love each other very much. This story explores this particular form of love for humans and smart machines. It takes inspiration from the Foreigner lyric, "I Want to Know What Love Is" 5. If you are going to Mars, you had better love your spaceship and it had better love you. Perhaps we all, human and machine alike, really do want to know what love is. This connection is what may someday sustain people as they take some of the most challenging steps our civilization has ever taken: going beyond Earth for months, years, and perhaps longer in order to explore our solar system and understand our universe. 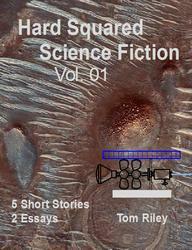 This story is of an extension of an existing type, a road story but set on Mars. A later story in this volume, "They are Not Coming", is an example of a standard story type, the Police Procedural, in which the plot follows the procedures the police use to solve a case. This story is then also an Aerospace Procedural in that that story follows the processes used for a portion of a major aerospace project. Perhaps we simply cannot travel or send information faster than light. Perhaps the answer to the question, "Where are they?" is that the distance between the stars is vast and the universe is simply not old enough. Perhaps, despite the odds, great civilizations will cross paths among the stars, and soon. But then again, perhaps, they simply are not coming. It was overcast and cold in Baltimore. We had not yet had our first snow of the year, but you could tell it was coming. This was the week after my detective partner of five years, Bill Wilson, died in his sleep of a heart attack. I had told him to retire the year before, but he hadn't listened. My mood was somewhat less than elevated when the police dispatcher told me to head out to the old city dump road on a routine 911 call. The house was run down and full of cast-off furniture. A quick walk through brought me to a back bedroom where an old man lay dead in his bed. He had probably been there since last night or yesterday. The cause of death was clear enough -- after a lifetime of living next to a garbage dump, scrounging off other peoples' junk, he had with considerable effort succeeded in drinking himself to death. "Why'd you call homicide?" I asked the patrol officer, Butler, who had responded to the 911 flash. "Everything I see here looks like a natural death. Where's the person who called it in?" "The stiff there is a William Johnson. The call came in over the Internet from someone identifying himself as Mr. Johnson's business partner. There was no one else here when we arrived, everything looked all right, but then we found this." He replied pointing to an old strongbox. It was heavy and had once had a good lock, but the lock had been forced years ago judging from the rust in the scratches. The box opened easily. On top were a few papers and some cash. Below those, mixed in with personal mementos, were two metal bars, one gold, one silver, a plastic baggy with some loose gemstones, and one gold ring with a gaudy diamond setting. The contents were worth ten grand at least, no questions asked, in any pawnshop in Baltimore. "Was it here when you found it?" "Right there on the top of the dresser, anyone could have grabbed it," Butler informed me. "The ring is on a watch list, so I called it in." "Yeah, I recognize it. This ring ties to one of my open cases. It belonged to a drug lord who called himself Señor Zapata -- he vanished about six months ago. The old man here must have found the ring somewhere out in that landfill. Like as not, it was still attached to a dead hand." "I don't relish looking for the rest of the body," mumbled the officer and then pointed to the back door. "There's something else, come look out back." In the backyard were decrepit wooden and metal racks full of junk almost good enough to keep. At the back of the lot, where the unkempt yard met the landfill proper, sat a round picnic table with a sun umbrella. Something about it looked out of place. It certainly wasn't new, but to me it looked more like a movie set made to appear old than someone's cast-offs. Beyond the fence was an older section of landfill that had been reclaimed. It had a slight rise compared to the neighboring land and was now covered with thriving, native vegetation. Beside the table was one lawn chair and on the table sat a laptop computer. It was open and turned on. One cable ran through a hole in the center of the table and vanished into the ground. "They are not coming," the computer announced as I sat down. "Mr. Johnson is dead, and they are not coming." The synthetic voice was clear but had such a melancholy tone it sounded like someone who had lost more than a business partner; more like they'd lost their reason for living. The screen showed an image of a young African American man wearing a silver-gray suit. The overall effect was more computer generated than real life. The guy's expression matched the voice. His stance, however, was that of a model. He was standing in front of a backdrop the color of rain-soaked concrete. "I'm Lieutenant Sepulveda of the Baltimore Police Department," I said, "Who are you?" This is a first contact story. Most first contact stories assume that faster-than-light travel is possible. This one does not, yet it makes the case that first contact is still possible and that is the whole point of this story. In an informal discussion in 1950 1 the renowned physicist Enrico Fermi asked the simple question, "Where are they?" By this he meant that as the universe has produced one technological civilization, it is only reasonable to assume there are other such civilizations, given the number of stars. Then why have we not already been contacted by alien civilizations? In fact, why are we not already up to our eyeballs in them? This story explores one possible answer to Fermi's question: advanced civilizations are rare, the distance between the stars is vast, and no one can travel faster than light. Under these conditions, sending anything between the stars requires advanced technology, enormous resources, and tens of thousands of years; that is, sustained action over deep time. Under these assumptions, the most economical thing to send is information accompanied by the absolute minimum amount of machinery needed to make use of that information. It is absolutely vital that the machinery then makes the maximum possible use of local resources when it gets there. It must get matter and power when it gets to a new location no matter what form those resources are in. Living matter cannot survive a trip between stars under these rules, even in deep hibernation. If we cannot go to the stars personally, then the next best thing is to build copies of our civilization out there. Such efforts are not so much notes-in-a-bottle as coconuts floating aimlessly in the vast ocean between islands. At some point a few will reach new shores and grow new palm trees. Also, just in case our civilization-building machine meets unfriendlies, it would be a good idea to keep a low profile until the local situation is well understood and the home base has been appraised. Furthermore, it would be wise to not send any more information about yourselves than absolutely necessary. You simply cannot know whose hands, or tentacles, it might fall into. As to style, despite being written in a dark film noir style, the story strongly reflects the anthem of the Earth environmental movement's Pat Humphries, "Swimming to the other Side"2. This story asks us to take "swimming to the other side" to mean crossing the space between the stars and "loving spirits will live together" to refer to all the salient creatures of the universe, not just us humans. Sometimes fate deals you a hand and you have no choice but to play it. It doesn't matter that it's not your style, or that your gut tells you no; you simply have to play it. It was only a few months after I first met Silver that he left a message with the police dispatcher saying he needed to see me again, urgently. Since that first meeting, I hadn't been able to investigate a single new case. As soon as I flashed my identification, all anyone wanted to discuss was Mr. Silver, despite the fact that I had no continuing connection to him. Space aliens will do that to people. The next morning I drove out on the old dump road. Everything was the same -- and everything was different. There was now a high chain link fence around the whole area, topped with razor wire, no less, and a gate with several guards. Outside the gate were a large new parking lot and a raised viewing area for the public. News crews from all over the world were now more or less permanently encamped on it. Inside the gate, the old fence was still there, as was the same mound of earth with the same nicely maintained native plants. But now there were high-tech devices sticking out of the mound between the bushes. I am sure the mound was a little bit taller; it certainly looked more impressive. And it was now obvious that a million and a half alien robot bugs lived there. They were not hiding anymore. Those robots, taken together as a hill, constituted one Mr. Silver, and that is who I had come to see. Did I say a million and a half? God knows how many there were by now. Silver had been feeding like a fat man at an all-you-can-eat buffet for months. It was a cool spring morning. The guards waved me though on the strength of my police badge, but they still checked my name and face on a database. There weren't too many cars getting past the gate, but the line of trucks was impressive, and each one was checked by a bomb-sniffing dog. Near the gate was a not yet finished government communications center, but that was not where I was headed. I drove a hundred yards or so farther until I saw the sign, "Johnson & Silver, Inc.". The old, dilapidated houses that had been there only months before were completely gone. Silver must have eaten them all. The world headquarters for Johnson & Silver was a narrow prefab office building located next to a big metal industrial structure that backed up against the old fence. The line of trucks at the front of this building was busy unloading miscellaneous cargo. Behind the office was a row of three shipping containers. Two were white, new and proudly emblazoned; one was used, unmarked and rather nondescript. I parked beside a waiting cab, walked up to the office door, and let myself in. The center desk, fashioned from glass and steel, caught my eye as it seemed to modern for where it sat. Its surface was clear except for a large laptop and a single silver bug. One end of the long room was packed with electronic equipment attended by a full complement of the little silver crawlers. At the other end were a number of beige cubicles occupied by several people busily working on computers. I assumed they were the ones buying all the materials arriving in the trucks. Behind the central desk was a striking, well-dressed black woman in her mid-thirties. "Good morning," I said, "I'm Lieutenant Sepulveda. I have an appointment to see Mr. Silver." Visions of how to solve the great problems of the 21st century. Silver is a social robot in exactly the same since that ants, bees, and termites are social animals 1. Humans are also social animals, but in a slightly different way. The evolution of social animals is rare, but where social animals have evolved they have been stunningly successful. Sometimes you must go hunting for answers. Sometimes you must pull out all the stops and call on everything you know to find those answers. Sometimes the answers you find are not the ones you most wanted to hear. The death happened before I got back from Hawaii. I was working full time for Silver by then and had seen something in the news, but at first I didn't see the connection between this particular death and Silver's work. Rested and tanned, I was back out at Silver's hill on a bright summer's day. The line of trucks was still there; now trucks were unloading at all hours. There were once again three of Silver's shipping container eggs in place against the back fence. The writing on one was Cyrillic and a second was Mandarin, I think. All there boxes were shiny and white this time. The big government communication center was now just about finished but not yet officially open. There were fewer news crews hanging around, but the viewing stands had become an international tourist attraction and were packed with people. Along the front were the picket lines of the alien zealots both praising and denouncing Silver. The picnic table and umbrella fit the weather for once. And all around were little silver robot bugs scurrying around in the summer heat. "You did a good job in Hawaii," Silver said as I sat down. "As you know, we didn't get much opposition while sighting your son," I reported. "Nothing I couldn't handle. His new home is an isolated cove on the Big Island. You'd like it. We moved his container in with a workboat, and the job was done before anyone knew he was coming." Another window opened up with a scene of palm trees swaying along a white beach and dolphins playing in the lagoon. The old shipping container only looked a little bit out of place, half hidden at the tree line. "He sends his thanks," Silver continued, "and reports he is progressing well with his digging in and his communications with the dolphins. They have given him a name, although it isn't pronounceable in any human tongue." "The people at the dolphin communication center started calling your son 'Captain Nemo', after all their trained dolphins began paying attention only to him." "The scientists are monitoring everything that goes on," Silver said, "All communications are open. Very soon they'll learn to speak dolphin, too." 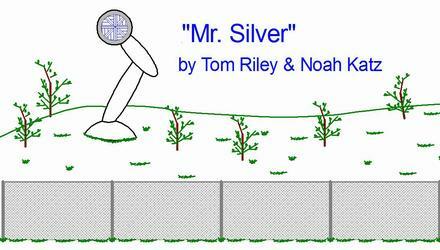 "Something new has come up here," Silver continued, changing his tone, "A young man has died and I would like you to look into it for me." "Was it a suspicious death?" The Maven Tech Net idea proposed in this story is a design of a social network especially for technical people. This design for a new internet technical design tool is now in an embryonic state but could very well move forward. This series of stories is the introduction of this design approach which will clearly take much more work. The word "maven" is a good English word that means what people mean when they commonly use "Geek" or "Nerd". But, it is not nearly so offensive. A Geek is a sideshow act in which a homeless person eats live chickens while pretending to be a cave man. A Nerd is a rather unflattering character from a Dr. Seuss story. In contract, maven is one of those great words from Yiddish that means exactly what you want to say and sounds great too. This word has been used in English for about 200 years. Black Swans 1 are a real concept too. They are changes that are extremely unlikely to occur but if they do happen then all of society changes. The problem today is simply that there are so many nearly impossible things floating around out there that several Black Swans happen every year. This results in an emotionally disturbing rate of change is now a hallmark for the 21st century. The scene around the counsel fire is a depiction of the specific concept of buy-in which is a real concept supported by specific brain modules. Buy-in is the human mental condition necessary to complete all large projects that require the efforts of a large number of people. It has served humanity well from the time of the Pyramids, through the Gothic Cathedrals, and right up to Apollo to the Moon. A widely accepted understanding of buy-in includes the following steps: (1) a person hears a new idea, (2) the person understands that idea, (3) the person sees themselves in their mind's eye succeeding with the idea, (4) the person takes on mentally that they own a piece of that idea, (5) the person commits in language, (6) the person gets in action on that idea, and (7) the person stays in action for a long time. The defining result that proves that buy-in has occurred is that the person stays in action for a long time, often decades. Buy-in is just one idea from modern brain studies that will be needed to make the Maven Tech Net work. This story is also a specific design exercise called, a Reality Distortion Field, which was made popular by Steve Jobs. The key steps are: (1) identify your customers, (2) identify the time period of interest, (3) define your new product or surface, and (4) identify your customer's needs in that time period with your new product in existence. The product under design here is the Maven Tech Net. "Oh, God, how tired I am." He spoke out loud but not to anyone and not to himself. He sat on the narrow bench in the airlock and slouched against his pack. 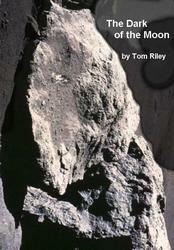 Every time he stirred, the tracked-in lunar dust ground between his boots and the metal floor, grating on his nerves. Nikolai Aleksandrovich Ozerov was a tired man. He had handed the damaged cable through to the tech robot as soon as the inner lock door opened. The repair should not take long; the remote robot operator, the American James McKay, was competent. And so Ozerov just sat: his close-cropped hair slick with sweat, his hands hanging down between his legs. He sat waiting. It was the last task of the last job of Cosmonaut Ozerov's long career. Outside was the hard vac; and the dust; and the heat; and the cold; and the job, his job; and the loneliness, his loneliness. It was the very end-of-the-line. It was the west limb of the Moon where you really could hide from the noise of Earth behind any little roll of the terrain or shadow of a rim-mountain. Outside, a dozen remotely controlled radio telescopes rested on the floor of Crater Grimaldi. The Earth hung well below the western rim of the crater, the rim blocking out the noise of all mankind. Radio noise, light noise, every noise -- all of it. For the approaching 14-Earth-day-long lunar night, the noise of the sun was blocked out too. 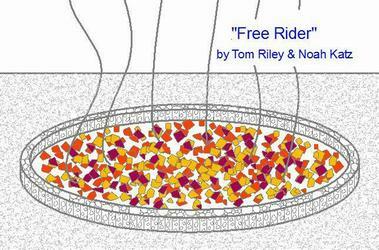 Like metallic gossamer, the radio dishes floated above their cold superconducting bases. Their commands came in and their data went out over a shoestring of fiber-optics cable. He had helped the robots plow that line into the lunar regolith. The line ran up eight kilometers through a pass in the eastern crater rim to a high point where the Earth could just be seen at all times. No radio transmitters were allowed here to disturb the silence. Even the local robots stood motionless when there was science to be done. No one lived here of course; people are noisy. When it was needed, new equipment would be shipped to Grimaldi direct from Earth; then a single spacer would fire up a Lunar Hopper and join it. With one short burn he would enter a suborbital ballistic trajectory that carried him one quarter of the way around the Moon. The Armstrongville to Science Station Grimaldi express, one quick burn to start, one skillful burn to stop. The half hour between was all free-fall. "Found it," McKay called out, his head just visible on the small monitor. "There is a fiber glass needle run up under the cable sheath. It nicked the cladding on a data line." "How long to repair?" Nikolai barely moved his head. He was beyond caring what must be done; now he cared only how long it would take. "I can swap in a spare line in a few minutes, but I have to take data for a failure report first. Oh, one hour total." That was par for this course. "Give me a ten-minute-to-completion heads-up," replied Nikolai slowly. This story is a homage to the oil painting "Oh, God, How Tired I Am" by Josef Minsky 1. The story assumes that there is a manned station near the lunar South Pole called here Andersonville, but the number of people working on the Moon is very small. In this scenario the usually two men for safety rule is dropped in favor of a one man and robot for safety with a human robot operator on Earth. The story does not assume that a full size colony has been established or even an industrial operation like a Helium-3 mine. This would put the year as early as 2024. Return to Woodware main page.